Note: This article has been updated to clarify its focus on the number of people getting to space, removing to my best capability what mistakenly came across as comparing suborbital systems with no track record to much more capable orbital systems in any other term than the fact of raising the count of people getting above 100km, the official border of space. Astronaut is a general term for people who get to space, meaning beyond 100 kilometer (62 mile) altitude, also known as the Kármán line. Over the passing decades since the first astronauts, the title was worn mostly by government workers, hand-picked to do some pretty ordinary things such as install antennas and structural modules, measure blood pressure or grow plants (not counting the early days anomaly of going to the moon). Of course, doing these things about 400km above sea-level, relying on technology for life-support in an otherwise very hostile environment and all that after being strapped to a rocket. OK, not so ordinary after all. For several years, and with more vigor than ever since the first X-Prize and SpaceShipOne, several companies (some of which presented at NSRC earlier this year) are working on a type of vehicle that will take people to space and back without completing an orbit (suborbital) and in between provide three to five minutes of micro-gravity, useful as a joy ride or for conducting science. As these vehicles become human rated, it is possible that after it took about fifty years to get the first five hundred people into the sixty two mile club, it may take a tenth of that or less to get the next five hundred in. I'll leave the economics aside, as I want to try and understand the nature of these next five hundred and ponder about their similarities and differences to the five hundred that saw the curvature of the Earth first. Astronaut backgrounds morphed through the years. Initially they were seven fighter jet pilots, all men, who were picked to be the U.S. manned space program representatives in space, a.k.a. the Mercury 7. Through the years and specifically with the space shuttle, astronauts started falling into different categories such as Mission Specialists and Payload Specialists and included people from walks of life other than the military, such as scientists and teachers. All were and are exceptional people by nature of the game of numbers - there are just so very few of them - five hundred over five decades hand picked and held to the highest standards. Also, since every flight was so expensive (one shuttle flight costs in the ball-park of $500,000,000 up to $1,000,000,000), money was pretty much no object when it came to training, which took years and cost millions (pretty similar model to fighter pilots, albeit some more zeros to the right). How will this change when everything is compressed by a factor of 10, 100 or 1,000? For example, some suborbital vehicles are designed to fly five times a day and need only a few hours of recycle time compared to flying a few times a year and a recycle time of several months (about three orders of magnitude difference). Suborbital vehicles are much cheaper than orbital (or beyond) spacecraft because they answer much easier requirements - they fly much slower, they don't have to withstand reentry and they spend a fraction of the time in space than that of orbital systems. Cost of a seat on the upcoming XCOR Lynx is $95,000 compared to almost $56,000,000 for a seat on a Russian Soyuz as this NASA press release indicates (two and a half orders of magnitude). It takes years (and now getting worse with the retirement of the space shuttle) to get experiments to the International Space Station, while it could take as little as a few days or weeks to get an experiment approved on a suborbital flight. Granted, capabilities of these suborbital space crafts are nowhere near those of orbital systems and what they achieve is merely go up, spend a few minutes in microgravity (freefall) and come back to where they took off. Also, all of this is up in the air right now because, well, none of the aforementioned vehicles are as of yet up in the air and fully operational, and there will probably be delays and cost overruns on the way. However, even if you slow things down and take away from the current predictions for a ramp-up period the numbers speak loudly, and the list of everyone who's ever seen a view similar to the inspiring Thin Blue Line photo I borrowed from NASA for the Spacepirations logo will become exponentially longer much quicker. So far I've established a cautiously optimistic prediction that in a few (maybe ten, hopefully less) years there will be a need for a lot of professional suborbital astronauts (of course, that's a part of the context of founding Astronauts4Hire, though this is not the subject of this post). Can we extrapolate from the government astronaut core and get to what it will mean in terms of credentials and training to be a professional suborbital astronaut? To some extent, we can. Similarly, there will be physical training, strong academic and operational background and testing. But as numbers go up, inevitably we should see specialization and grouping, much like happened in the computer industry for example. As a budding industry that will need to stand on its own, commercial suborbital companies or researchers will need to be careful not to pile requirements and training beyond the necessary and as a result make prices go up, pulling the rug under their ability to fund and operate at the frequency they will want and need to. As an industry that's been government-based and run by a different set of rules than commercial companies go by (for example, the requirement of being profitable), it will be all too easy to fall into the trap of requiring every bit of NASA training and then some. But will that be in the best interest of everyone involved? I don't think so. Like conducting experiments on the ground, different experiments and setups will imply different levels of people such as lab technicians, scientists or even photographers in addition to pilots, of course. Depending on numerous factors different skills and professional backgrounds will be needed, much like in other industries. Parallels can be drawn with other professions as well. For example, there are several levels of software development professionals, from a junior level programmer to (depending on the specific organization or company) Principle Software Engineer, Chief Architect, etc., all with different levels of salaries, job descriptions, capabilities and responsibilities but all consisting of a basic trait of being involved in the process of turning ideas into written code. Similarly there will be different types and levels of professional suborbital astronauts when numbers scale up, all sharing a common denominator of being trained to operate in micro-gravity and be versed in the details of their tasks - conducting a predetermined list of tasks, being a test subject, documenting results, etc. 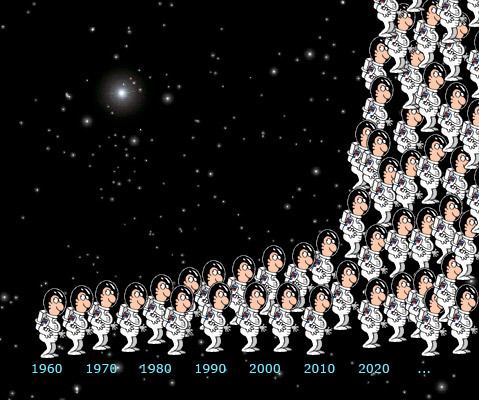 No one can be sure of when exactly the graph of astronaut count over time will look like a Hockey stick or what exactly will be the requirements when hundreds or thousands of suborbital space flights happen every year. Until this new crop of space crafts takes off and gets a positive track record the talked-about numbers are at best educated guesses. It is also obvious that while suborbital space crafts will take people to space, they will have very different use than existing orbital systems, and will not replace them in any way, shape or form. One thing is certain - every single one of the new breed of professional astronauts will experience the wonder of getting to space flying on a suborbital spacecraft, if only for a few minutes at a time - majestic views of the Earth curvature and fragile atmosphere included. but I think it goes without saying I'm all about the hockey stick!! I don't find this evaluation to be a valid one, since it compares a PowerPoint suborbital vehicle to an actual orbital vehicle. The Russians have the advantage of having an existing, proven spacecraft. You do admit this point but nonetheless maintain that the 'numbers' (i.e. XCOR's ballpark figures based on PowerPoints?) speak so loudly that XCOR and the like will win the day. XCOR's current suborbital price sure is a lot less compared to an orbital ride on the Soyuz...but I seriously doubt that XCOR's price is realistic or accurate, given that it is still only in the PowerPoint phase of production - you can't set an accurate price for something that hasn't even been built yet. It's like buying a house...you can't just take into account the purchase price when you're creating a budget for montly mortgage payments. Virtually everything in that house will need to be repaired as it inevitably fails, and the new homeowners will quickly discover that their projected budget for the mortgage alone was far below the mark. "As a budding industry that will need to stand on its own, commercial suborbital companies or researchers will need to be careful not to pile requirements and training beyond the necessary and as a result make prices go up"
What training would be considered necessary vs. unnecessary for suborbital astronauts? I don't think I'd feel particularly comfortable signing up for that ride if I knew that the qualifications and training were minimal and corners were being cut...this isn't like prepping for a guided whitewater raft ride, where you learn which end of the oar to stick in the water and then go on your merry way. Safety is a very important issue for consumers, and the point here seems to be to show that suborbital flights are more consumer-friendly than orbital ones - training and preparation is, in my view, the crux of safety for most consumers. At any rate, thank you for sharing your article - I look forward to reading more! I don't claim and don't think that XCOR, Virgin Galactic or anyone else is going to have any capabilities similar to Soyuz or any other orbital systems. I completely agree (and wrote) that suborbital crafts aren't flying yet. I didn't write that any of the suborbital crafts will replace or 'win' over existing systems (retired or not). I agree and admit in the article that since none of the suborbital industry is operational the numbers may change. However, the current known numbers are so far apart that I tend to think that even with a factor of 5 in the price we're still looking at a person getting to space (beyond 100km, not claiming orbital or anything like that) at a fraction of the cost than that of existing systems. Regarding your second point, I fully agree. Just like I expect a bus driver to have more training than me as a driver and an airline pilot to have more training than a private Sesna pilot, I definitely expect adequate training. I didn't say corners should be cut. All I said is that suborbital astronauts getting all the training that NASA gets and then some would be an overkill from the necessity standpoint and also cost prohibitive. I'm sure you'll agree that training an airline pilot (who is responsible for the lives of hundreds of people) with the same rigor, time and cost of an orbital astronaut or even a fighter jet pilot isn't such a good idea. Thanks for your feedback, I hope what I wrote above makes the article context clearer.